Dabbling in Day Dreams | Making daydreams happen in everyday life! Did everyone have fun trick or treating? I know we did! I’ve been dreaming of these costumes for months. Mycah didn’t agree to it until just last week and at 1:35 AM today, I finally finished. I can’t take credit for inventing these costumes. Like many things I do, I found them on Pinterst. You can check out my Homemade Halloween Pinterest board for more details. I will say I did not read the tutorials, I only used the pictures for reference. So without further ado here are my babies. I love making my kids their costumes. I feel like it’s a special memory that we will always have. I also like that because I made them with hooded sweatshirts they were warm despite the cold. You don’t have to sew to do this for your kids. In fact I did all of this with scissors and a hot glue gun. 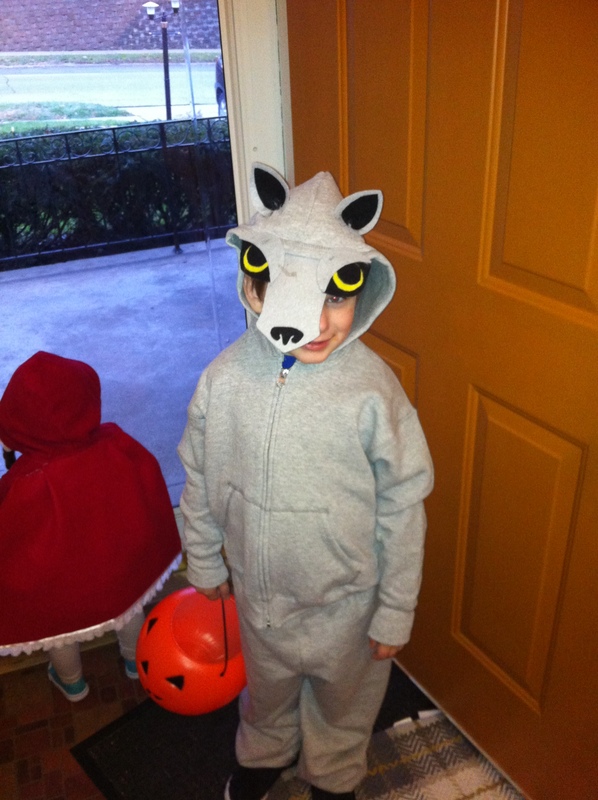 You could say that store-bought is cheaper but the truth is, Mycah’s wolf costume was $20 but only because I bought the pants as well (because he can wear them for more than Halloween). Harper’s, which was more complicated to make, still only cost me $15. I think $35 for 2 little kid costumes is not that bad! This is my last post of the 31 day challenge. So thanks for hanging in there. I will definitely keep blogging, just not at this punishing rate. I am hope to make it at least twice a week. Again thank you! If you’re new to this blog, welcome! If you checked me out from my link on the Nesting Place, I really appreciate your visit! Please comment, I would love the feedback. I don’t have a brilliant how too for any of these costumes you are about to see. Just a mom with a creative use of materials. This isn’t a detailed post because I am still hard at work making costumes. 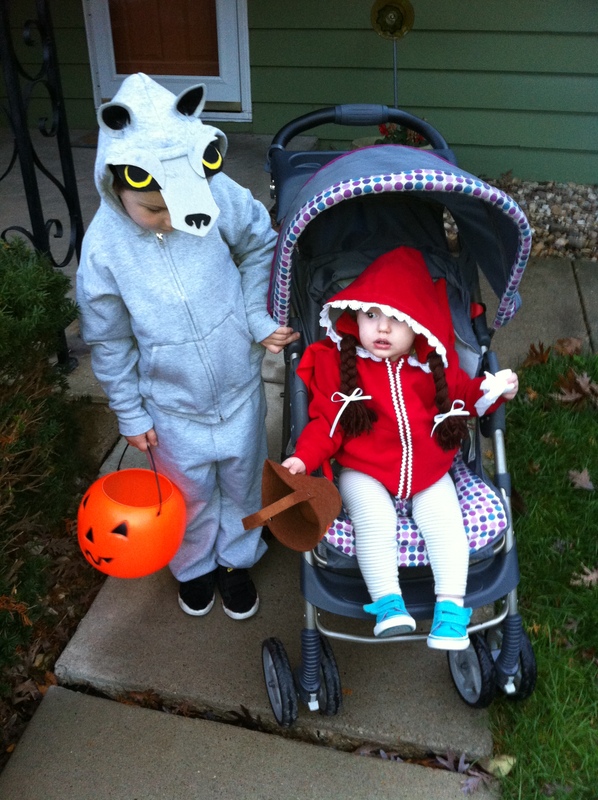 Harper’s costume is all done and just big brother left. In 2012 Mycah’s favorite movie was Nightmare Before Christmas. On one shopping trip to Target he found a Halloween dog collar that he had to have and an idea was born. Since I don’t have any in progress, photos I’ll give you the material run down. I bought white foam for the floppy dog ears, a white hooded sweat shirt, a white sheet and a giant white pipe cleaner (yes they sell such a thing at Michael’s and it makes a great dog tail). 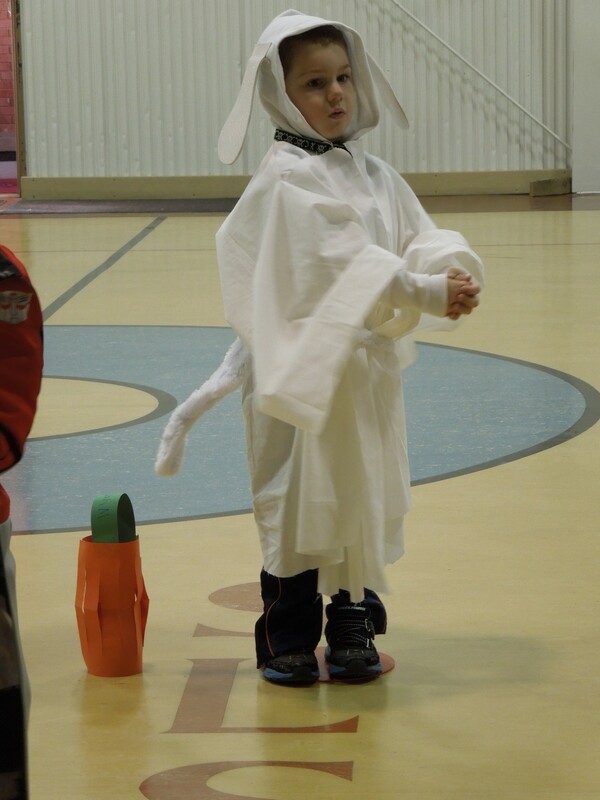 Zero the Ghost Dog certainly was unique at the preschool costume parade! Our older girls wanted something entirely different. Here is where I broke down and just bought costumes. The decided to be Monster High Dolls. 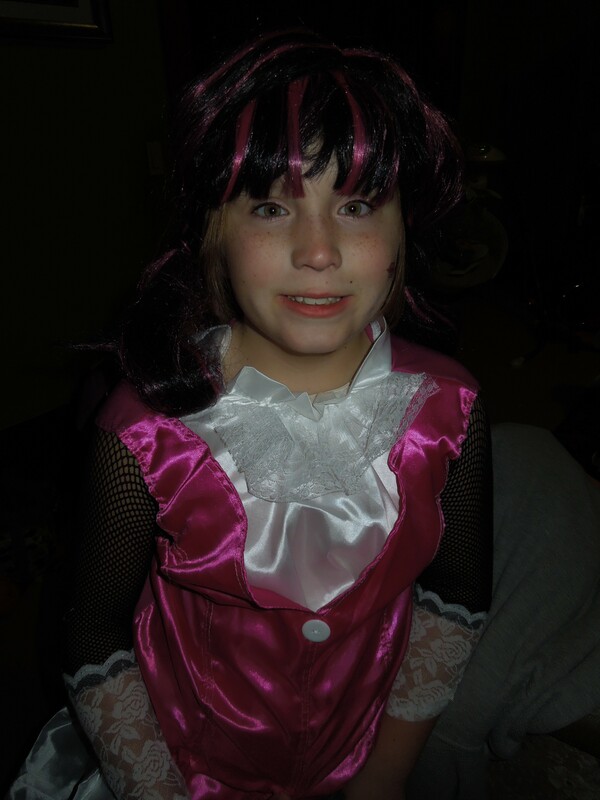 Kira who was 10 at the time got the full store-bought costume as Draculaura. Stormi and Raven are a different matter, they wear adult sizes at 13 and 14 so they got store-bought wigs and that was it. For Stormi who was Clawdean the werewolf she was happy and didn’t want anything else. Raven however was a challenge. She was Operetta (daughter of the Phantom of the Opera). 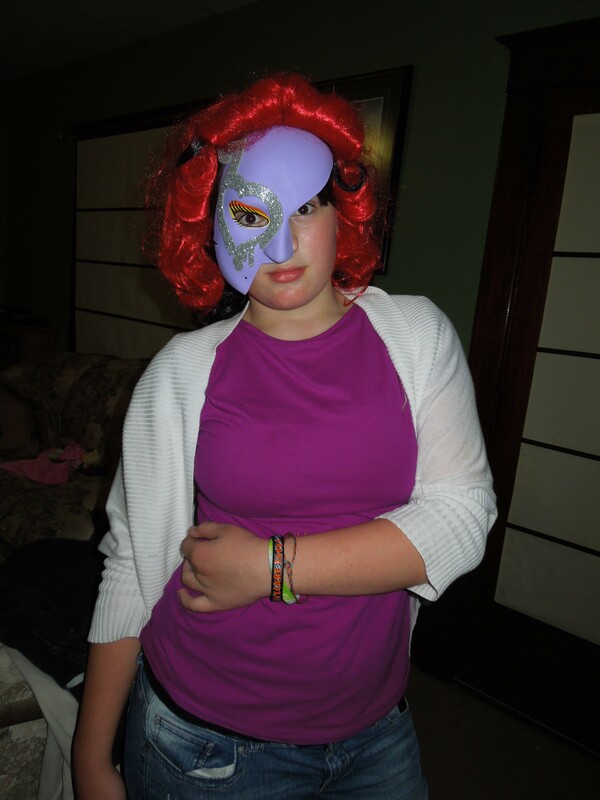 We searched her everyday clothes until we came up with a reasonable outfit, but the mask, I made that using a plain white mask, craft paint and silver glitter craft foam. I think we came out pretty good! 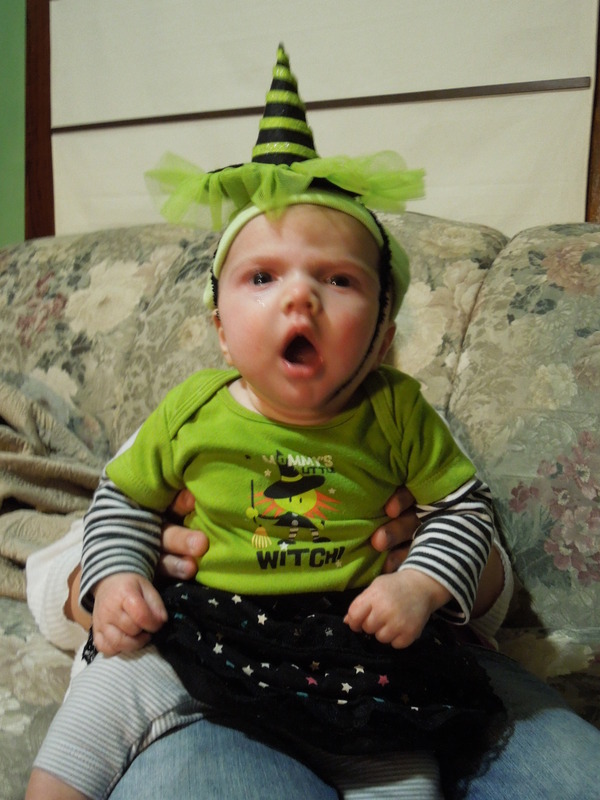 The Harper was only 4 months old, to small for trick or treating but I thought she made a great little witch. 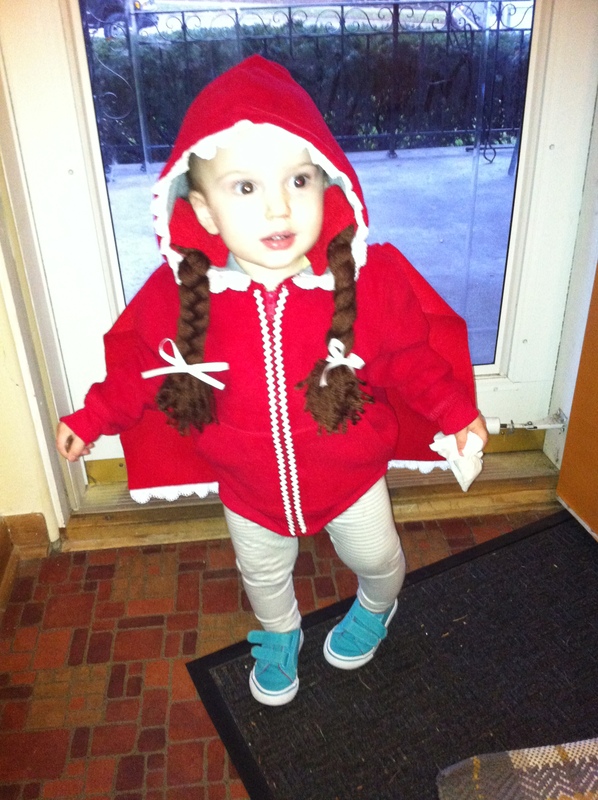 You can’t see it in the picture but she even has striped leggings and ruby-red shoes! OK I know this post wasn’t the greatest. But it was a fun look back. 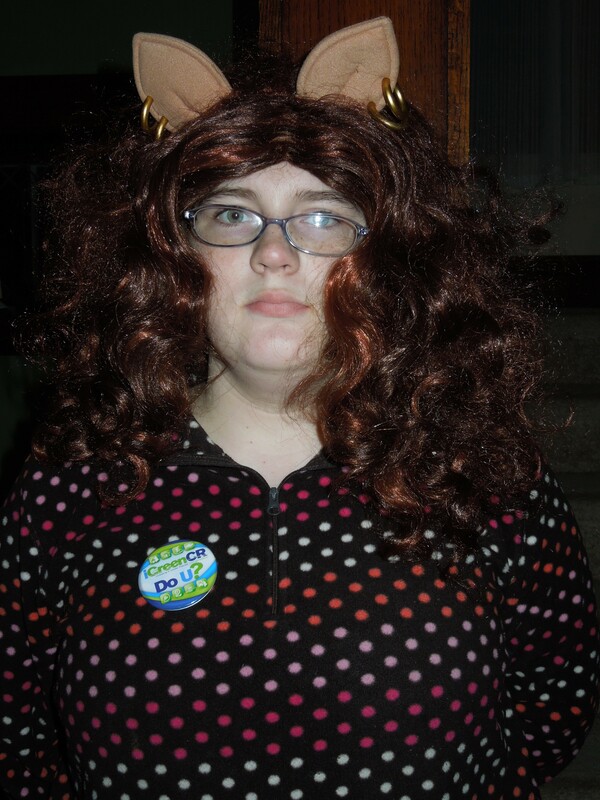 I’m still knee-deep in costume making. So back to work I go! So thanks for hanging in there. Tomorrow’s the reveal of this year’s costumes for Mycah and Harper! If you’re new to this blog, welcome! If you checked me out from my link on the Nesting Place, I really appreciate your visit! Please comment, I would love the feedback. Yesterday I missed a post. I went on a kindergarten field trip to the pumpkin patch with my son at school and was so exhausted afterword that I fell a sleep on the sofa. No one had the heart to wake me. So that was that. I’m sorry. Now lets talk about something fun! October 2011 I wasn’t walking. In fact I was hooked up to a wound vac, I hopped around on one foot with a walker and spent the rest of my day on my back with my leg in the air. Mycah was 3 going on 4 and I was determined to make his costume just like I had the year before. 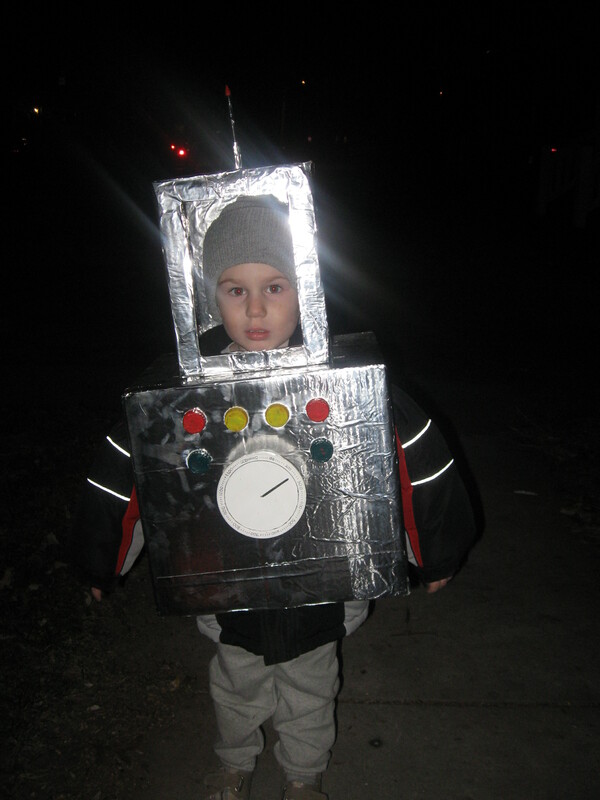 My little man was dreaming about being a robot. See the antenna? 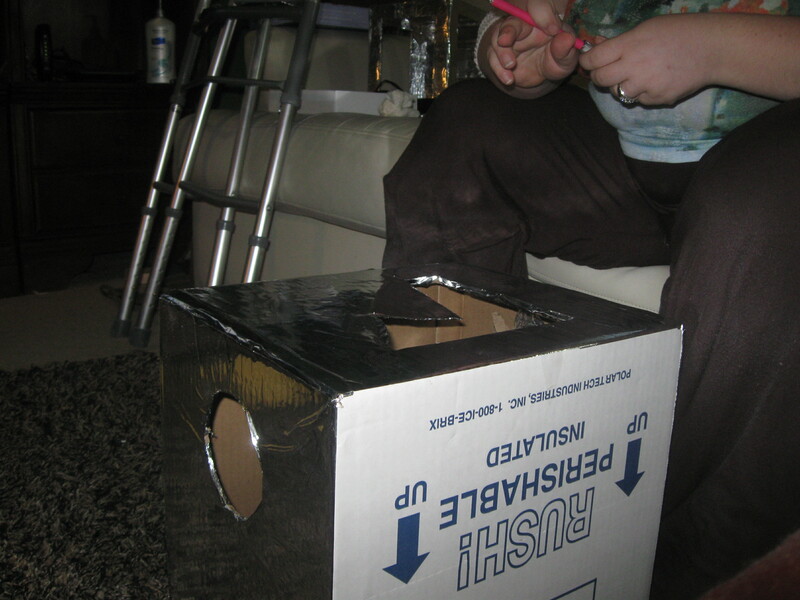 The last-minute I duct taped a broken mechanical pencil to the top of his helmet box. Needless to say my little guy was super happy and warm. There were some comical moments (picture Ralphie’s brother in a Christmas Story “I can’t put my arms down!”). 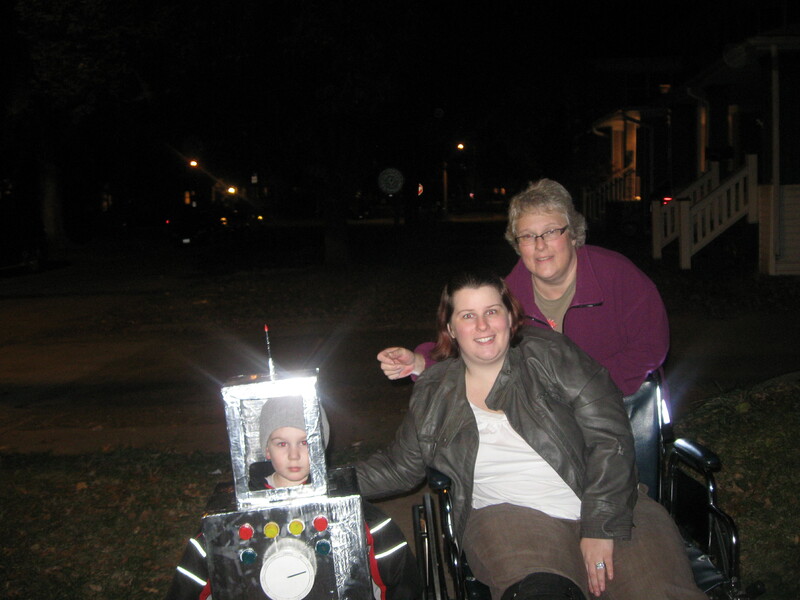 Grandma came over and, bless her heart, pushed my wheelchair around the neighborhood so that I wasn’t left out of the frightnight festivities. So thanks for hanging in there. 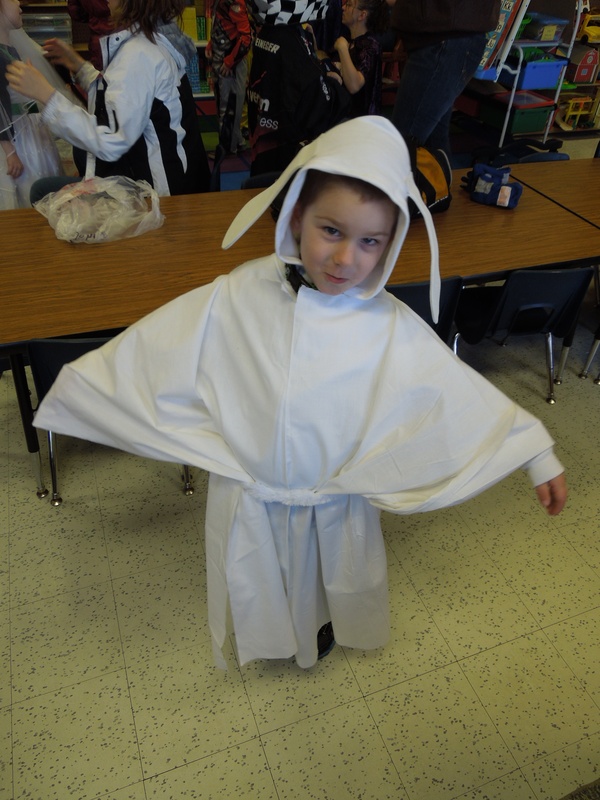 Tomorrow we’ll check out another costume of Halloween past so stay tuned. If you’re new to this blog, welcome! If you checked me out from my link on the Nesting Place, I really appreciate your visit! Please comment, I would love the feedback. I am so excited for this Halloween! Last year Harper was only 4 months old so it was kind of low-key. For me the best part of Halloween is making it special for my kids. I love dreaming up and making their costumes. No, I don’t sew, but I’m pretty handy with a hot glue gun. There has been some great ones through the years. 2012 Mycah was the ghost dog, Zero, from Nightmare Before Christmas. 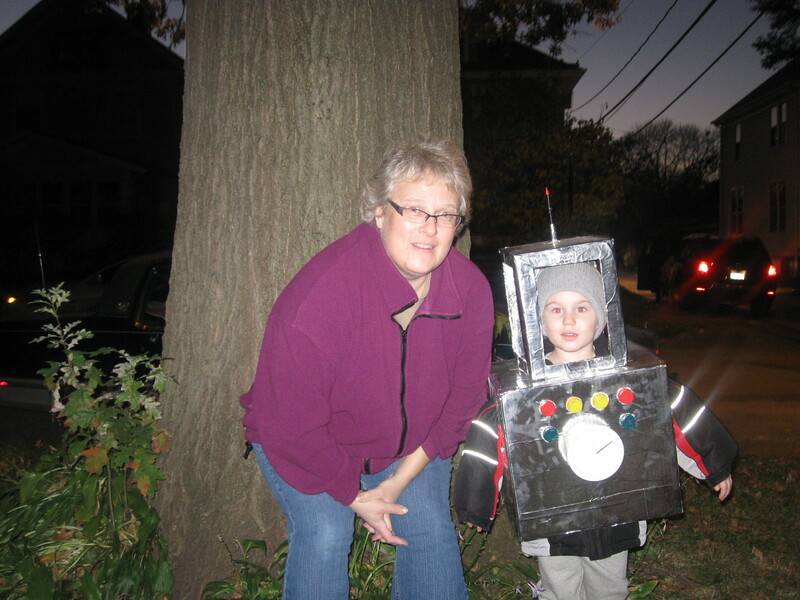 2011 Mycah was a robot. 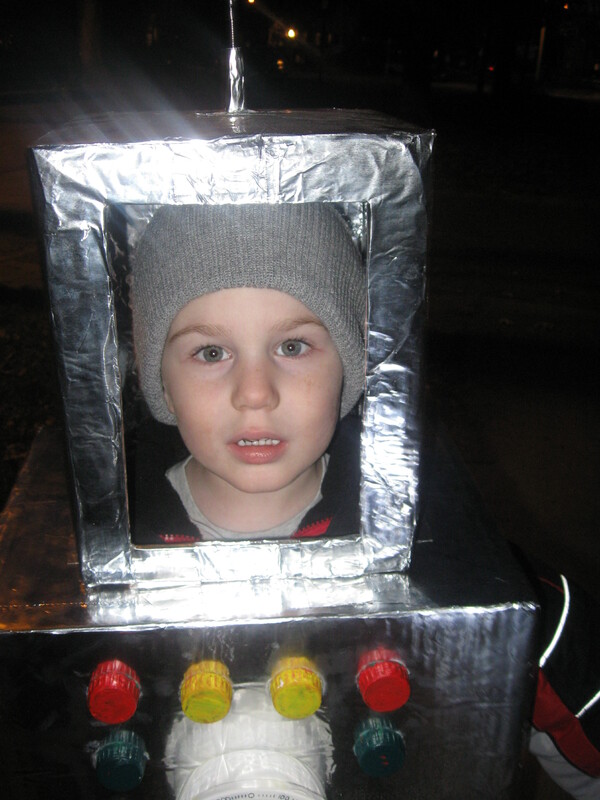 I spent hours spray gluing tinfoil to a box that he wore over his winter coat, It had dials and everything! 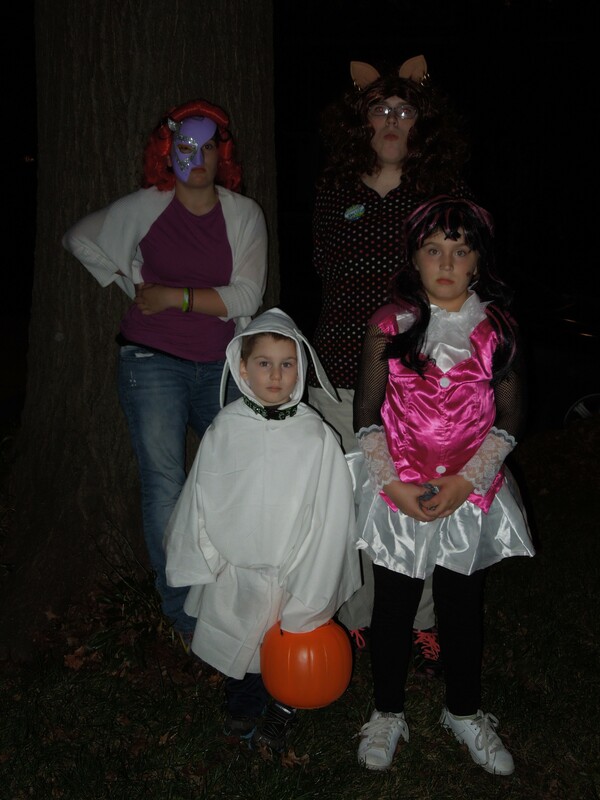 2010 The kids dressed in a theme. Mycah was the Cheshire cat, Kira was the Queen of Hearts, Raven was the Mad Hatter and Stormi was the white rabbit. 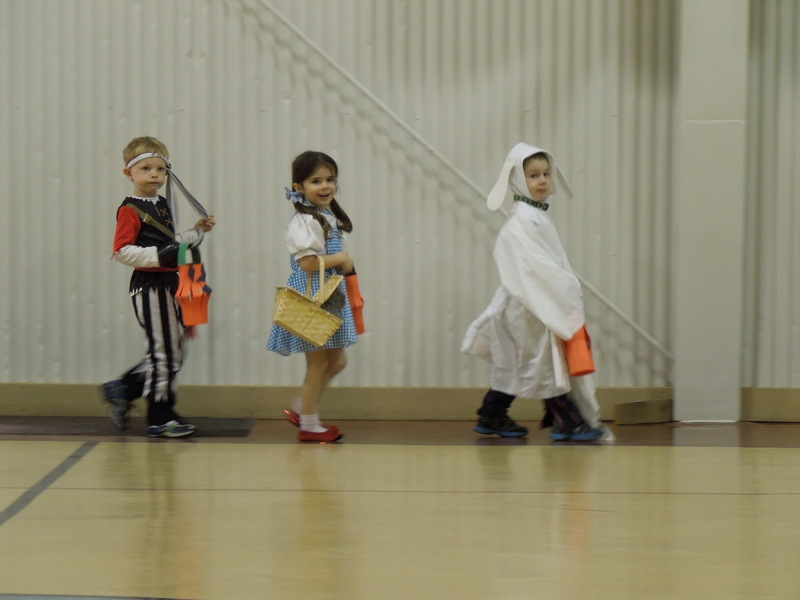 Two of the 3 kids placed in the church costume contest that year. I was proud. Each year I made or embellished their costumes to make it special. This year I am so exited to make costumes for Harper and Mycah. I’ve been dreaming up ideas all year, but Mycah needed to get on board. At five, he’s got his own ideas, in fact until last week he was telling me he wanted to be a zombie. Then as we were looking at pictures for ideas he declared he wanted nothing to do with face paint so he wasn’t going to be a zombie. I saw my chance and I took it. I started showing him pictures of little red riding hood and the big bad wolf. He’s game! So here’s the plan to finish out the week of the 31 day challenge. Everyday leading up to Halloween I’ll share photos of the costumes the kids and I dreamed up and Thursday we’ll reveal the finished costumes for 2013! What costumes are you dreaming up? I’d love to hear it! If you’re new to this blog, welcome! If you checked me out from my link on the Nesting Place, I really appreciate your visit! Please comment, I would love the feedback. My greatest dream as a parent is to raise my children to be dreamers. Really I think most parents would say the same thing. I approach this in three ways; active listening, an open mind, and encouragement. This sounds simple but it’s harder than it really seems. We all have our preconceived notions of what we want our children to be; for instance I wanted Mycah to be a musician. I am saying discard that and just watch and listen. That doesn’t mean you don’t guide them. I have listened to my son go on about drawing houses and I have watched him build things out of all sorts of make shift materials (the tower of cereal boxes comes to mind). I listened when he asked me to watch the “building shows” (home remodel shows on HGTV). So one day I provided some encouragement by telling him what an architect does. I don’t know if that will be his dream, but he can’t dream about what he doesn’t know. Now I’ll keep an open mind for whatever he tells me next. I’ve taken similar steps with our older girls. When Raven told us she wanted to be a doctor, we started watching more Discovery Health Network and we talked about how much education she would need, to prepare her with what to expect. When Kira was nine she told me she wants to be on broadway. I offered to take her to a musical at our local community theatre. I ask her about show choir tryouts and encourage her to try out for plays. If she told me tomorrow she didn’t want to do that anymore, I’d ask why but I would respect her change of heart. Stormi is into drawing Japanese Anime. I’m not sure if she wants anything out of that other than a hobby, but I encouraged her to take Japanese (since her high school offers that language), I buy her art supplies and we encouraged her to take art classes at school. I feel like it’s my job as their mom. My Mom encouraged me and I can do no less for my kids. How do you encourage your kids? What dreams are they discovering? Heading into the weekend before Halloween it’s bound to be busy. Costumes, pumpkins and parties take over our lives. I don’t know about you but when life gets busy I need something short and sweet. This week I have one short suggestion to help you squeeze in some reading pleasure in between the festivities. I do not consider myself one of the Moning Maniacs, as her followers have dubbed themselves, but I will agree that Karen Marie Moning has churned out some really great series. I started out reading just her Fever series. I will admit that had I not read the Fever books first I would never have given the Highlander books a chance. I am very glad that I did. This week I am recommending a novella from the Highlander series called Into the Dreaming. It centers around a novelist and her connection, through her dreams, to one of her highland characters. I am intrigued by the possibilities. Have you read any dream related books lately? Anything you’d like to recommend? Leave a comment and fill us all in. If you’re interested in the suggested reading for the last three weeks check out week 1, week 2 and week 3 of this weekly feature. If you’re new to this blog, welcome! If you checked me out from my link on the Nesting Place, I really appreciate your visit! Please comment, I would love the feedback. I’ve been having a lot of writing epiphanies this week. Using the skill more will do that to you. Today I realized a scene was missing from my first novel that I need to insert into the second draft. I know why I didn’t think of it sooner. I was avoiding it. I think I knew it had to happen I just didn’t know the logistics, still don’t. So I need a brainstorm session. I will purposely go to bed thinking about this and visualizing it like a TV show in my head. Maybe my subconscious mind will dream me up the answer. A girl can hope anyway. Are you ready for it? Riddle me this…how do you steal a body from the morgue before they do the autopsy? There are limitations. You’re stealing it during the day when it might be busy but you can’t go out in the sun and neither can the body. The part I know is that it would involve a big distraction and you would likely hide in the building until dark. What kind of distraction would clear out the morgue? I feel the need to watch episodes of Dr. G on the Discovery Health Network. God bless reality TV when you need information.